DAVIE, Fla. (AP) — Ryan Tannehill was among the first players on the field Tuesday, tossing short passes to an assistant equipment manager before practice even began, trying to make up for lost time and lost games. The Miami Dolphins plan to start Tannehill for the first time in seven weeks Sunday at Indianapolis . Coach Adam Gase said Tannehill has progressed enough in his recovery from a throwing shoulder injury to rejoin the lineup, and said the quality of his passes appears to be 100 percent. Tannehill said his shoulder still hurts when he throws, but the stabbing pain he felt earlier is gone. Tannehill’s return provides a welcome lift. Replacement Brock Osweiler went 2-3 as the starter, and the offense has gone nine quarters without a touchdown. The Dolphins (5-5) have lost five of their past seven games, but because of a logjam of .500 teams in the AFC, they’re in contention for only their third playoff berth in the past 17 seasons. That means Tannehill has a shot to play in the postseason for the first time in his seven-year career. Tannehill will start this week for only the sixth time in Miami’s past 31 games. A knee injury wiped out his 2017 season, and this year he hurt the capsule in his shoulder in Week 5. Progress in rehabilitation was so unsteady at first that the Dolphins shut down Tannehill for a time. Gase acknowledged the possibility of another setback. “Like I told Brock, ‘You’ve just always got to stay ready,'” Gase said. 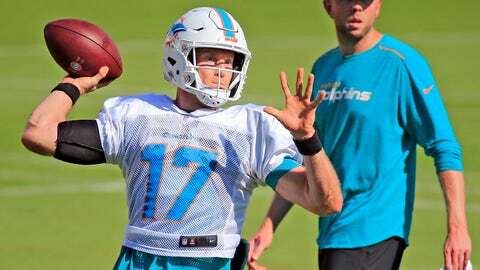 But Tannehill said he made significant strides during last week’s bye, and said doctors have told him he doesn’t risk further injury to the shoulder by returning. He threw in practice Tuesday for the first time since mid-October, and is now unleashing passes of more than 50 yards while making more than 100 throws per session. He comes back to an offense missing his most dynamic options. Since he was sidelined, Albert Wilson and Jakeem Grant have suffered season-ending injuries.